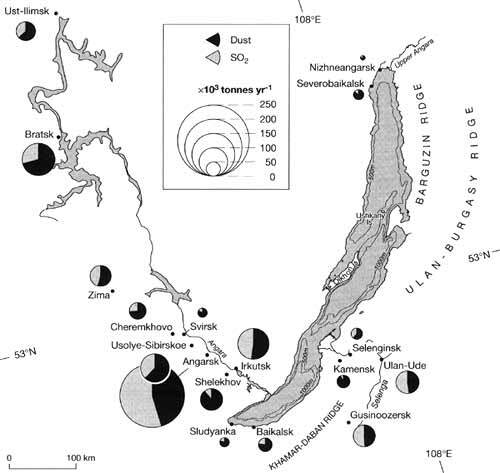 Human influence around Lake Baikal has been evident since at least the Neolithic period when small populations hunted nerpa (or Baikal seal, Phoca Sibirica) on a seasonal basis (Weber et al., 1993). Asian populations, such as the Buryats and the Mongols have also existed around Baikal for centuries, while the first Russian settlers did not arrive until the mid-17th century. It has only been since the 1950s, however, that environmental concerns for the lake developed into national and international issues. These concerns focused mainly on point source pollution (from two paper and pulp mills built in the 1960s-l 970s in the towns of Baikalsk in the southern basin, and Selenginsk on the Selenga river), and over-fishing. By the 1980s, the campaign against these industries gathered pace, but had now extended to include logging of the catchment and overfishing. In the late 1980s, thousands of nerpa died from a morbil-livirus (Grachev et al., 1989), and environmentalists suggested that the seals' immune systems had been degraded by increasing pollution levels, including persistent organic pollutants (POPs) and heavy metals (Galazii, 1991). Furthermore, pollution from industrial and domestic wastes, increasing eutrophication, uncontrolled fishing, and logging of the catchment were also linked to declines in fish growth rates, the disappearance of endemic animals, and a general influx of more cosmopolitan flora and fauna: Lake Baikal had become an international cause celebre (Galazii, 1991; Maddox, 1987). For example, the baikalian Coregonus is non-migratory and its numbers were severely depleted since the 1950s due to overflshing, but since the introduction of catch controls, populations have increased significantly (Atlas Baikala, 1993). On the other hand, many other scientists firmly believed that changes in the biota of the lake can be explained by natural variation (e.g., Grachev, 1991) and during the 1990s, international research programmes were established to collate scientific evidence on the past and present environmental state of Lake Baikal (under the auspices of BICER — Baikal International Centre for Ecological Research). It has recently been established that pollutants indicative of fossil fuel combustion (e.g., spheroidal carbonaceous particles, SCPs) have increased over the last 50 years: increases were greatest in the southern basin, although small increases were also evident in the north basin (Rose et al, 1998). These increases closely mirror levels of fossil fuel combustion in the catchment (Figure 17.8). As well as SCPs, Falkner et al. (1997) suggest that vanadium input into the lake is increasing, while Boyle et al. (1998) provide evidence for small increases in lead concentration in the south basin. Minor element enrichment is not as clear-cut as for SCPs, with Vetrov and Kuznetsova (1997) even suggesting that no enrichment is occurring. Overall, pollution levels are similar to those of Northern Hemisphere background sites, such as the Arctic. Using diatom analysis in surface sediments, Mackay et al. (1998) found no evidence of the endemic flora in the lake being affected by pollution (except for localized sites such as the shallow waters of the Selenga's delta). Increasing numbers of cosmopolitan taxa caused by pollution is suggested by Bondarenko (1999) but more detailed monitoring of the aquatic ecosystem is necessary. Current levels of metals in Baikal are greatest in the southern basin (Jambers and van Grieken, 1997), although Watanabe et al. (1996) dispute that toxic metals, such as mercury and cadmium, could cause immunosuppression in Baikal seals because concentrations are very low. Perhaps the greatest threat to the lake's biota, especially the nerpa, lies with increasing levels of POPs and DDT. It has been shown that the Baikalsk mill caused enhanced levels of persistent organic chlorines in the southern basin (Maatela et al., 1990). Trends are complicated however: in the air above Baikal, concentrations of POPs are similar to remote regions, again like the Arctic (e.g., Iwata et al., 1995); levels in fish are comparable to those in the Great Lakes in North America, while concentrations in the nerpa are similar to animals found in, for example, more polluted European waters, such as the Caspian Sea (Kucklick et al., 1994). Bioaccumulation of organic chlorine compounds, including DDT and PCBs, in the nerpa is thus clearly a problem, even though the physical environment of Baikal (i.e., water, sediments) contains relatively low levels of pollutants (Nakata et al., 1995). A direct link has not yet been made between increasing organochlorine pollution and morbidity and mortality in the nerpa, although mechanisms have been proposed (Nakata et al., 1995, 1997). Much more research still needs to take place, and it is encouraging in the meantime that several local measures to reduce pollution in the lake have already been taken, such as converting the two paper and pulp mills into closed systems.